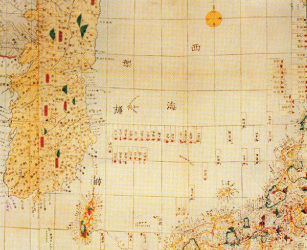 The modern history of Korea was determined by the Japanese expansionist ambitions from the forced opening of the Korean peninsula in 1876 until the end of the Second World War in 1945. Like a red line we can trace these Japanese ambitions; from the discourse about an invasion of Korea (Seikanron) in 1873, bypassing the opening of Korea, the war with China in 1894-1895 and the Russo-Japanese War, which had been fought to gain a hegemonic position in Korea, the Katsura-Taft-agreement, by which the United States and Japan drew the borders of their imperialist aims in Asia, to the step-by-step annexation of the Korean state, which became part of the Japanese empire in 1910. The main aim of the Meiji policy had been the total control of the neighboring country. Between 1905 and 1910 the Japanese government enforced Japanese rights in Korea by decreasing the independent status of the Korean government. The Koreans themselves were not able to stop this development and the international community was not willing to interfere in favor of the Korean state, even when a delegation attended the peace conference in the Hague in 1907. This paper studies the Ashkenazi exile in Barcelona from the advent of Nazism in Germany in January 1933 until the end of World War II in Europe in May 1945. The analysis will focus on the lives of Jewish refugees in the city during this time. There were two migration waves during the years studied: one that lasted from mid-1933 to the beginning of the Spanish Civil War, and a second one that coincided with World War II. 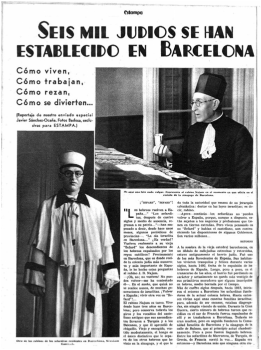 The paper aims to fill the gap left by the Spanish historiography by weaving the thread of the collective memory of a community of Jewish refugees who struggled to settle in Barcelona. Based on interviews with refugees and their descendants, this study employs micro-historical approach, trying to of rescue their memory, by lifting personal experiences to the degree of historical events. The article is a foretaste of the issues that will be covered by the project Verbannung: German-Jewish exile (1933-1945), led by the Jewish cultural platform Mozaika, and as such presents only part of ongoing research. Arnau González Vilalta presents an essay clearly divided into two different parts. First of all he sets out a forethought on the problems and difficulties of the historian’s job, focusing in this case in what he calls "the rhythms of the elements converging dissociated and at the wrong time" during the historical research: the book’s edition delays, the opening of new archives, the appearance of new sources, even the demise of oral witnesses in crucial moments during the publication process. All this makes the possible and even necessary changes and extensions of the book simply too expensive. In this sense, and as the second part of the essay, the author presents the specific case of his book La tercera Catalunya (Barcelona, 2013) –where he enquires about the political moment in Catalonia from 1936 to 1940 through the epistolary conversations between Ramon Sugranyes and Carles Eugeni Mascarenyes, two Catalan catholic nationalists claiming for a "third road" for a peaceful solution for the conflict; he also presents the appearance –when there was no turning back for the book’s publication, of two new monographs related to the study case as well as new discoveries in the archive, altogether providing new light to the investigation; the author finally explains how, this way, an essay like this became indispensable to extent a study case of which related book was no more extendable. In addition, at the end of the essay the documentary appendix mentioned is provided. This essay attempts to analyze the state of History today in Latin America. Through the use of four texts, the author questions the classical national historiographical discourses, which he considers to be the debtors of colonialist narratives. Related to that, the author supports a more vivid, multisourceful and multidisciplinary History, not just to break with the official discourse and to get a “truer“ one, but to reinforce the discipline in a time in which some academics claim “the end of History”, especially after the fall of the Communist regimes. The following essay examines the political development in Spain and Greece between the World War I and World War II, comparing these two Mediterranean countries and placing them in a broader European and global context. The conflict between the supporters of monarchy and republic as forms of government was extremely important in the political debate in both countries, and shaped their history in a quite remarkable way. The discussion of these intricate dynamics will help to appreciate the problems that Spain and Greece faced at that time, and can also contribute to a deeper understanding of some key features of the historical change in these two countries.